I began with second day hair that had been straightened. Note that if you want your hair to turn out curlier or to last longer you never want to straighten your hair first, although you can blow-dry it straight. Then I pulled out my Kiss InstaWave hair curler. This is like no other hair curler I’ve ever used. 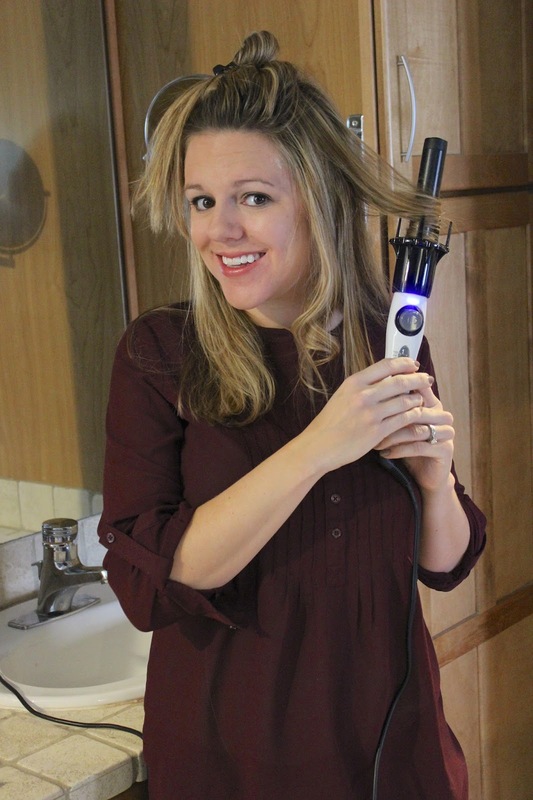 It has no clasp like a wand, but is fully automatic, tangle free, and creates instant waves. 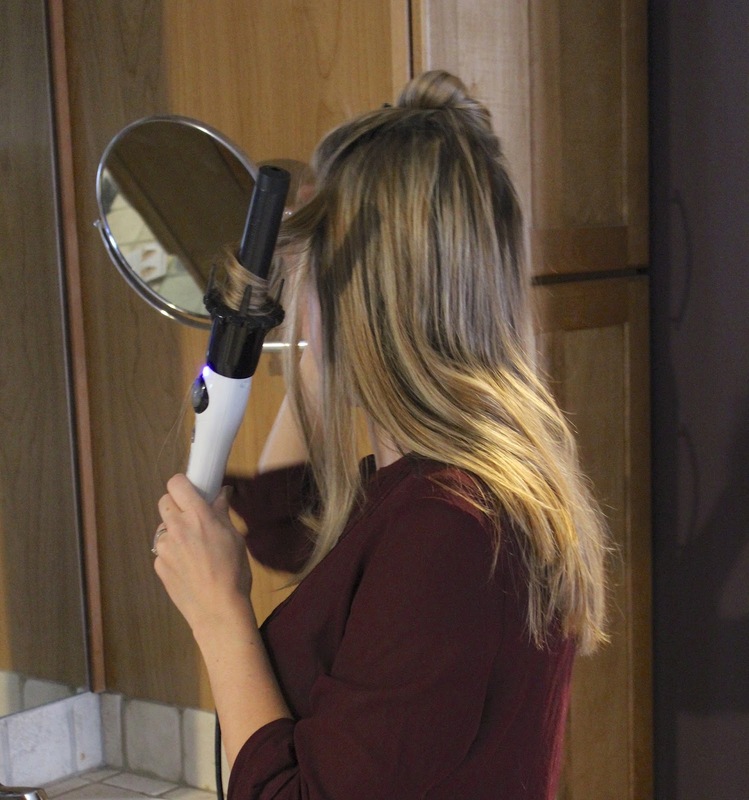 The curler is easy to use with either hand and from any angle. There is a curl dial that allows it to move and create curls in either direction, and it shuts off after 90 minutes which is great for forgetful girls like me. 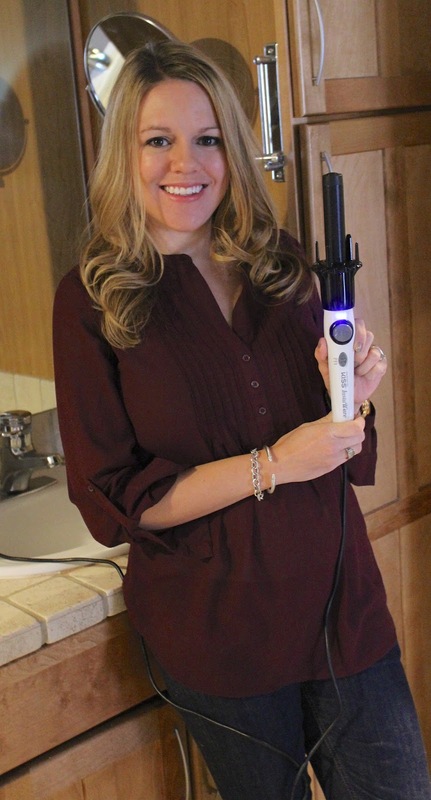 This curler also has both a low and high switch and a maximum heat setting of 420 degrees. First you will want to section off your hair as you normally do for curling. For me this just means throwing half of it up and then starting by sectioning off about 2 inch pieces of my hair from the front working my way back. You will want to hold the InstaWave vertically, slightly tilted towards you. If you start at the front like I do, you need to make sure you curl the sections going away from your face. To do this you will place the hair in front of the rod through the hair catch, and push the button directing away from you. (I place the rod about halfway up my hair so that my waves don’t go up too high.) The InstaWave then automatically and instantly catches the hair and curls it! Make sure that you hold the button until all of the hair is wrapped around the barrel. Hold it on for 5 seconds, then pull it down vertically and your hair will fall out. Do the first 2 or 3 sections on each side with the curls facing away from your face. After that, alternate curl direction for each hair section. When curling towards you simply put the hair behind the iron and through the hair catcher, and press the button that is going towards you. And there you have it – natural waves in less than 10 minutes! 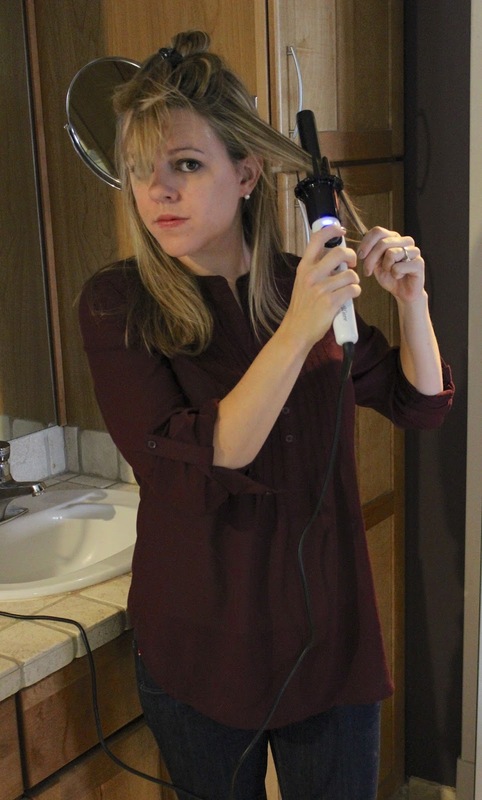 It might take a few times to get the hang of the Instawave, and to be honest I almost gave up on this curler, but once I watched a few Youtube tutorials and got it down, curling my hair was a breeze. I love using this tool to make soft waves. The biggest downside? The InstaWave makes a high pitch noise the entire time it is plugged in, and apparently this is normal. It isn’t so bad that I won’t use the curler though. Overall, I recommend this product to anyone that is looking for a device that creates natural and effortless waves! I received the showcased product complimentary for purposes of this review. Regardless all thoughts and opinions are my own and I only recommend products that I truly love. I can't believe I've never heard of this awesome contraption! Your hair looks fab! Looks like a great curler! I am addicted to my in-Styler! I need to try this. My hair really doesn't like holding any curl/wave!! I am always on the hunt for a good curling iron! Great hair. Good job! Loving the curly waves! Amazing. I never thought to do just the lower half of hair in curls, but I LOVE how that looks! Thanks for the idea. This looks great. I really need a new curler. Great tutorial!!! Turned out super cute!! Um, why is it making a loud noise and that is normal?! LOL no thanks!! Love your hair! I have crazy thick hair, and normally curling it takes FOREVER. I'm willing to try anything that will sped up the process! This is so awesome – I definitely need to get one of these! Nice hair Claire 🙂 If I grow my hair out again I might look for one of these. I will absolutely have to consider this product! I am so bad about just putting my hair in a pony. Something like this definitely needs to go into my rotation, though. Your hair looks great. I love this style. Sometimes I wish I didn't short my hair so short. so gorgeous!! and the baby is too cute!! I love your tutorial, I hate doing my hair but maybe I will try this soon. This sounds like such a clever curler – I always get arm ache when I try and do this, then end up giving up and straightening it again – the curls usually fall out by mid day anyway! You look gorgeous. Does the curler work quite slowly? I'd be so scared that my hair would get stuck and it would burn it right off! I may have to try this product! I have stick straight hair so I'm always looking for great products that help give me natural looking waves. I love big curls! I'll have to check it out! This does look super easy. I usually just bun my hair to get waves, but my hair is SUPER long. So pretty! I love the waves it gives you! Good tutorial. Your hair looks so pretty. Fierce! Great look on you. I have to admit, I'm not sure who has a better look going- you or your adorable baby! That looks great and I love how easy it is to do. My hair has always been naturally curly so it is hard for me to get my daughter's straight hair to behave with waves. This would help! Super cute! My teenager would love this. Your hair is SO pretty! I have figured out how to curl my hair with my straightener, and it is the only way they stay all day! Gorgeous! Thanks for this tutorial! Looks fabulous! Thanks for the tutorial!